If one were to designate the most prosperous post-WW2 decade in America, without question, it would have been the 1960s. The economy was growing. Neither inflation nor deflation was evident. The American households were still saving and America was still a creditor nation. But as is always the norm, good things never last. The 1970s heralded the start of a tumultuous era for the American economy. Thenceforth America's growth was to be financed by ever increasing amount of debt. The chart above shows the yawning gap between America's debt and its GDP. 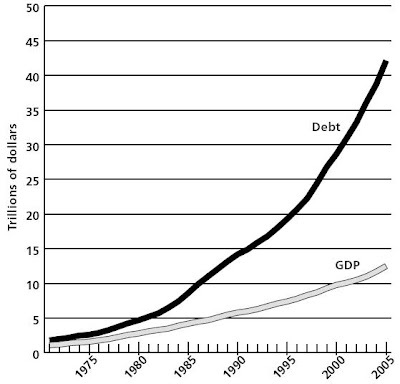 It is as if debt grows geometrically but GDP arithmetically. A detailed examination of the debt growth from 1971 provides an instructive view of how the US gradually surrendered control of its economy to outsiders, all the while without realising so. Why 1971? Because 1971 is full of connotations. First, it marks the year the debt first outpaced the GDP since WW2, growing by more than 10 percent. Another momentous milestone, on 15 August 1971, occurred when Pres. Nixon severed the link between the US dollars and gold in order to stem the flow of gold to other countries, notably France. It paved the way for debt (and its corollary, the money supply) to start its relentless growth. If the gold link were in place, the gold reserve would have constrained any debt increase and the consequent GDP growth. As the money supply rose, so was the pressure on commodity prices, simply because their supplies could not be hastily bumped up. Even now, it still takes 7 to 10 years for new supplies to come onstream. The 1973 Arab-Israeli War snapped the suppressed oil prices because by then the pressure for an increase had been 2 years in the offing. The trigger was the war but the root cause was the debt (or money supply). The debt also fueled the inflation past the 10 percent mark in 1974 as the debt growth outpaced the slowing GDP. The oil price surge upended the economy with increased oil expenditure constraining spending in other areas. Stock market and property collapsed as debts growth slowed. Nixon sought to reduce the federal deficit, slashing it to $6.1 billion by 1974. The fed funds rate was raised to almost 13 percent by July 1974. The resulting recession in 1974 cost Nixon the presidency. He had to resign during his second term to avoid impeachment. Nixon wanted to control the debt but in the end the debt got him. Gerald Ford who replaced him for the remainder of his term was beset by persistent inflation and high unemployment, a phenomenon known as stagflation. Actually towards the end of his term, inflation dropped to as low as 4.9 percent but the high unemployment killed his reelection hopes. The debt again rose as Carter took up the presidency in 1977, corporate financial and non-financial debts being the main cause. Towards the end of his term, he sought to rein in the debt. Again the economy slipped into recession in 1980 as inflation crested at 13.5 percent. Like how it brought down Nixon, the debt showed no mercy to Carter. Out he went. When Reagan came into office in 1981, Paul Volcker, the Fed Chairman, attacked inflation with a vengeance. He jacked up the fed funds rate to 20 percent. Inflation tumbled to 3.2 percent by the end of 1983. As debt growth slowed to 10 percent, the wrath of the public was heaped on Volcker instead of Reagan. Without the inflation debasement, the US dollars became a stable currency, much sought after by foreign exporters. At the same time, the Japanese had made inroads into the US market and they were happy to be paid in US Treasury bonds. Reagan soon discovered that America could borrow to the hilt without the pain of inflation. The supply capacity constraint was broken by the opening of the Japanese manufacturing spigot. So America went on a debt and import spree. Sure enough, Reagan got his second term. Aside from the Volcker induced recession at the beginning of his presidency, Reagan never had to endure another recession. In short, the American public could have its cake and eat it too. Bush, the elder, was elected in 1988 on the coattails of Reagan's popularity. But he was alarmed by the state of the government budget. He raised taxes in departure to his election promise of no new taxes. Despite this, he actually increased the budget deficits throughout his presidential term. Yet the debt growth slowed down to 5 percent turning the US into a net exporter by 1991. The cause was the Savings & Loan Crisis which had started in 1987 following the rapid debt growth during the Reagan years. The consequent deceleration in private sector borrowings contributed to the 1990-1991 recession and sealed Bush's fate. Like Carter, Bush was shown the door after just one term. Clinton was elected in 1991 on the strength of his slogan, "It's the economy, stupid!" Of course, he did focus on the economy, that is on enlarging the debt. That contributed to his successful second term bid. Towards the end of that term, the dotcom boom kicked in. Businesses and financial institutions piled on increasing amount of debts deluded by their optimistic view of the future. Clinton disingenuously claimed credit for the government budget surplus, after continual deficits of more than 30 years. That feat was only possible because of the private sector's tremendous debt build-up. The dotcom boom fizzled out and a short recession ensued in 2001 as Bush, the younger, came into office. But the debt kept its relentless growth, this time powered by the households and financial institutions. The new debts were related to mortgage financing. Bush saw to the growth of these debts throughout the eight years of his tenure. These massive debts however could never be repaid. Their unwinding falls on Obama's lap. How the process will unfold is the subject of another post, "Bernanke vs. The Market."